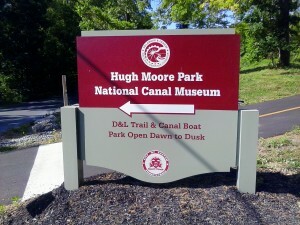 The Hugh Moore Park trailhead is located along the D&L Trail spur that leads to the National Canal Museum, Canal Boat Rides, Locktender’s House, and Delaware & Lehigh National Heritage Corridor offices. Trail users should use the ample parking in the main Hugh Moore Park lot and please refrain from parking along the sides of the road and Lehigh River as it is harmful to the environment and causes traffic issues. To reach the parking lot, come across the one-lane iron bridge into Hugh Moore Park and turn right. Continue about 0.5 miles under the 25th Street bridge and the large parking lot is on your left. After parking you can easily reach the D&L Trail spur by walking away from the Lehigh River and toward the canal at the back of the parking lot. Turn left and follow the trail spur a short distance to where the continuous D&L Trail joins from your left.